Carpinus betulus ‘Fastigiata’ is a form of Hornbeam that has fantastic presence in any landscape, staying tall and narrow for 20-30 years before slowly widening. It can be kept in shape with regular clipping. 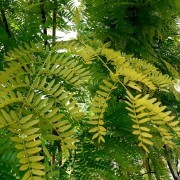 It has small deep green leaves turning orange-yellow in the autumn. 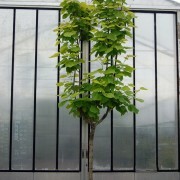 Catalpa bignonioides ‘Aurea’ is a medium sized spreading tree with very large oval bright yellow leaves. 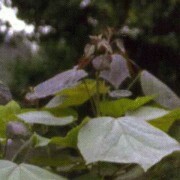 It has white flowers with purple markings which come out in mid-summer. Catalpa x erubescens ‘Purpurea’ is a medium sized largely spreading tree. It is more vigorous than most Catalpas. It has interest in the form of dark purple almost black new leaves slowly fading to green. 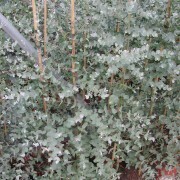 Eucalpytus gunnii has silver-blue and rounded young foliage elongating to a sickle shape and sage green when older. A relatively fast grower. Used a lot for screening. 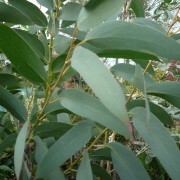 Eucalyptus niphophila is a broad spreading tree with large leathery grey-green foliage. It has a beautiful patterned bark. Often used for screening. 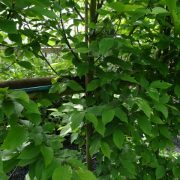 Gleditsia triacanthos ‘Sunburst’ is a medium sized tree has thornless stems and bright yellow foliage that rivels that of the Robinia ‘Frisia’. 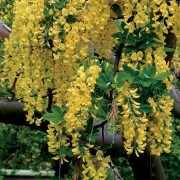 Laburnum x watereri ‘Vossii’ is a very popular small tree picked for its long chains of yellow scented flowers in late spring-early summer. 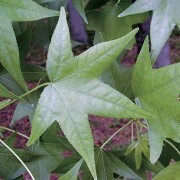 Liquidambar styraciflua is a medium to large tree which is chosen mainly for its outstanding autumn colour on five-lobed star-shaped shiny green leaves. Ideally planted on acidic soils for the best autumn colours. 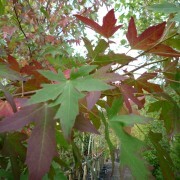 Liquidambar styraciflua ‘Worplesdon’ is a very popular form of Liquidambar as it is more suitable for the average garden. It has even more rich autumn colours of mostly orange and red. An added feature in the winter is the cork that develops on the wood of the tree. 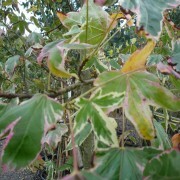 Liquidambar styraciflua ‘Albomarginata Manon’ is a pyramidal shaped, deciduous tree. It has blue-green foliage with a creamy-white margin, which turns pinkish in the autumn. This tree is ideal for small gardens.